The Yeti 1400 Lithium & Nomad 100 Solar Kit is the next generation of portable, award-winning power and innovative power stations on the market. The Yeti 1400 Lithium & Boulder 100 Briefcase Kit is one of the most versatile and innovative power stations a wide range of devices all the way up to refrigerators. The Yeti 150 & Nomad 14 Plus Solar Kit is a plug-and-play, silent, fume-free power station for short outages, garages, events, or wherever you need portable power. The Sherpa 100 Solar Kit is designed to power all the gear in your kit and can charge from the wall, the car, or even from the sun. 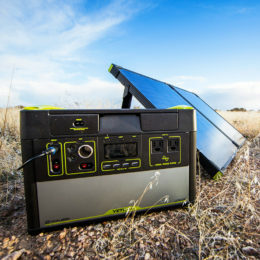 The Sherpa 50 Solar Kit can power your laptop as well as other devices and boasts a solar panel so you can have endless juice while away from a power source. The Venture 30 Solar Kit packs the power you need to keep those small devices, cameras, and tablets charged no matter the elements while away from a power source. The Switch 10 Core USB Multi Tool Kit can quick charge phones, POV cameras, and other USB-powered gear. It has a flip out USB Charging Tip and an LED Battery Indicator with an included Fan and also Flashlight tips.